Rubber Side Up is a project exploring over 3000 reported crashes in Western Australia involving cyclists from 2013 to 2017. There are 1.77 reported crashes per day on average, and many more go unreported. Indeed, in the 2015 report by the WA Auditor General it is estimated that only 21% of crashes requiring hospital treatment are reported to police, and only 12% of surveyed cyclists involved in a crash reported the crash to police. Encouragingly though, this is a decrease on the 1.95 crash/day average from 2010-2015. March 2019: in the recent release of 2017 data, Main Roads included crash type classifications which are now included on the crash map and can be filtered. Additionally, the number of vehicles involved in each crash is also visible now (not just the vehicle types). The data was supplied by Main Roads WA though this website is not affiliated with or endorsed by them. You can view the locations of each crash and details such as crash severity (i.e. fatalities, requiring hospitalisation, other medical attention, or property damage only) and what sort of other vehicles are involved. You can view crashes based on these classifications, or based on the speed limit of the local roads. Crashes have been collated and you can use the tabs above to view stats of crashes broken down by various categories. The crash data only records the number of vehicles involved. The number of people involved in each crash was not provided. Importantly, although some crashes have some crash description data available, the at-fault party is not identified. I have included some minimal commentary noting some trends or explanations that I or others have found. I say it's a commentary on the results rather than an analysis as it doesn't consider any of the underlying causes (for which I don't have data, and for which there are experts :) My job is programming and data wrangling - I'd prefer you to use this website as a resource to start discussions on how to improve things rather than it being my soapbox. This website was initially created for GovHack 2015, a weekend-long annual event promoting the use of open government data in Australia and New Zealand. It's still a work in progress. I aim to update this page over time to add more data and commentary - please visit again soon, and email me if you have any suggestions, criticism or further data to include. Click on a crash site to view more information (in some browsers you may need to double-click), such as the severity and the distance of the crash to the nearest designated bike route. Where numbers are shown, multiple crashes have been reported (see the Crash hotspots tab for more details). If you click on the number, it will zoom into that spot. Then if you click on the marker after it's zoomed in, it will expand to show further crash icons that you can then interrogate. You can toggle the display of different crash types using the boxes below. Scroll down to see more discussion below the map. person killed immediately or within 30 days of the crash as a result of the crash. Crash nature: this is provided as-is from the Main Roads data. Importantly it does not identify the at-fault party. Note that this is sometimes left blank. person admitted to hospital as an inpatient for treatment of injuries sustained in a crash, but did not die within 30 days of the crash. Crash type: this is a secondary classification provided as-is from the Main Roads data, recording the involvement of specific scenarios. Note that this is sometimes left blank. injuries from a crash in which the person was not admitted to hospital as an inpatient. Crash with other vehicle type (including cars) Property damage only. Sub-classified as PDO Minor or PDO Major based on dollar value. Click here to view the legend for more information. I will add some updated notes for the 2019 update soon. In the meantime email ouch(at)bikecrash(dot)info if you find something interesting that you'd like included here. Many eyes are better than one pair and everyone may have suspicions of trends in their local area that they'd like to confirm and make known. These hotspots are locations where at least three crashes have been reported at the same intersection. Again, the current state of each intersection is given. Locations with the highest amount of crashes are shown first. Below each crash location, the year and details of each crash are shown; note that some crashes involved multiple other parties. The intersection names are as given in the Main Roads database which is why some names may appear to be slightly wordy or technical, or may use Main Roads internal names (e.g. where it says Guildford Road & East Perth Terminal below, it's commonly known by the public as East Pde - I pull out the data directly without editing it). In total there are 130 hotspots for the 2010-2015 period. There are almost as many hotspots at roundabouts (44) compared to traffic lights (45). 13 further hotspots are at stop signed intersections, 27 are other intersections and one is at the Shepperton Rd to Canning Hwy onramp in Victoria Park. The Ardross St/Macrae Rd intersection has 11 crashes shown below, but it's in the middle of a 1km stretch of Macrae Rd in Applecross that has had 22 crashes reported from 2010-2015 and was modified in 2015 to reduce traffic. This data is based on the 2010-2014 data only. This tab displays crashes by vehicle and intersection. See also the PSP/PBN tab which has a preliminary comparison of crashes at intersections in general versus intersections on the PBN. Main Roads records crashes as occurring mid-block or at an intersection. I further classified "intersection" crashes as being at: traffic lights, where a traffic signal is located within 50m of the crash site; roundabout, where a roundabout sign is located within 50m of the crash site; or stop sign, where a stop sign is located within 50m of the crash site. As I have had to infer the intersection type using the current locations of traffic lights and signs (the actual intersection types and locations don't seem to be publicly available directly, at least not yet), these intersection types are as of June 2015 rather than at the time of the crash and may have been upgraded or downgraded (depending on the actual infrastructure and your opinion) since then. If you have access to nearmap you can use it to look at aerial imagery at various times in the past. Note that there seem to be some seemingly odd cases recorded such as at the intersection of Morley Dr and Crimea St in Morley where a crash is recorded as "midblock" (you can view this on the crash map). I have left these cases intact as Main Roads may have some reason for it. Unfortunately the crash data didn't include descriptions of the crashes (such as that provided in the Queensland crash data) which could provide more insights. I'd be particularly interested in looking at "midblock" crashes and seeing how many cyclists are being hit from behind or sideswiped, or by people pulling into/out of driveways/street parking. The two graphs immediately below show the same data, but the roles of the two data categories have been swapped. The below graphs are derived from the same information, but each column has been normalised to show proportions for each category rather than raw counts in order to make trends more visible. There are more crashes at intersections than mid-block. This is interesting as there's a lot of focus on overtaking cyclists safely yet the majority of crashes are at intersections. I don't have access to bike lane locations, but it would be interesting to plot the number of crashes in bike lanes, and at intersections on roads that contain bike lanes on either side of intersection, but not in the intersection itself. Also, it may be worth comparing the amount of funding going to intersection upgrades compared to installing on-road bike lanes, when the majority of crashes occur at intersections. If anyone has this data, please let me know! As the number of fatal crashes is quite small, I'll list the breakdown here: 3 at traffic lights, 1 at a roundabout, 4 at other intersections and 15 mid-block (none at stop signs). So although there more crashes at intersections than mid-block, there were 15 fatal mid-block crashes compared to 8 fatal crashes at intersections over this period. However the percentages of crashes at intersections resulting in hospital visits or requiring other medical assistance (16.6% and 30.5% respectively) was higher compared to mid-block collisions (16.0% and 26.4% respectively). Here crashes are shown by crash severity and the current speed limit of the road. Note that the speed limit may have changed since the crash. School zones are not taken into account. Again, the graphs are first shown as raw counts and then are normalised to show proportions. CSV files are available below each graph, note that these do not contain counts for crashes where the speed limit was unknown. Just looking at the total numbers by severity, over a 5 year period, there were 23 fatal crashes, 583 crashes resulting in a trip to the hospital (so about every 3 days on average someone goes to hospital or worse), 1029 crashes requiring other medical treatment, and 1932 crashes with property damage only. And these are only the reported crashes. Most roads in the metro area are 50 or 60 km/h zones and as you'd expect, most crashes occur in these speed limit zones. Generally, crashes become more severe (i.e. resulting in a higher proportion of hospitalisation or fatalities) in higher speed limit zones, though due to the small sample sizes we get a couple off outliers such as 110km/h zones being fatality-free, and a greater proportion of crashes in 10km/h zones requiring hospital treatment compared to most other speed limit zones. These outliers aside, the results are probably what you'd expect. Here crashes are shown by vehicles involved and the current speed limit of the road. The speed limit may have changed since the crash. School zones are not taken into account. Note that the Main Roads crash data does not identify which party was injured, i.e. these statistics reflect the overall outcome of a crash, not just what happened to cyclists. This is particularly important when looking at the severity of crashes with motorcycles and pedestrians. This tab shows crashes by "administrative area" in and around the Perth metro area. The Main Roads database contains a number of areas that largely appear to be local government areas. However as there are a few areas that do not have corresponding local governments, I've called them administrative areas. Cottesloe and East Fremantle have the next highest rate of crashes and it's well known that there is no grade-separated PSP connecting this area to Fremantle. A string of crashes are visible on the crash map along Curtin Ave (despite the presence of a bike lane) and Marine Pde. Although Stirling has recorded a high number of crashes, it also covers a large area containing a lot of roads and so the crash rate per kilometre is in the middle of the pack. These graphs display the distance (as the crow flies) of crashes to the nearest bike infrastructure. Further below, I've included a comparison of crashes at intersections on the Perth Bicycle Network (PBN) compared to all crashes. Principal Shared Paths (PSPs) are typically off-road and located alongside railway lines and freeways. 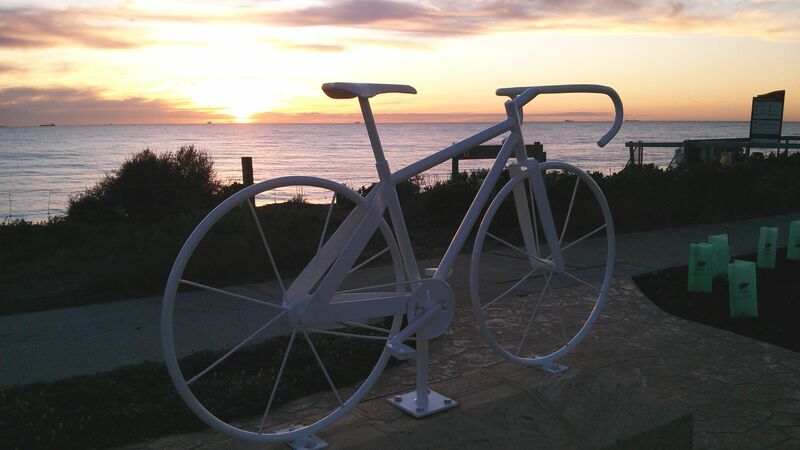 The Perth Bicycle Network (PBN) is a collection of routes that often utilise roads (not necessarily containing marked bike lanes) and as such reach further than the PSPs. Both of the above route types are shown on the crash map. Other designated shared paths are typically low-speed recreational paths, e.g. South Perth foreshore and around Lake Monger. These are not shown on the crash map. I'm currently working on comparing overall crash data to crashes on the PBN. I'll post more results here over time but for now, here's a comparison of crashes by severity (left) and vehicle (right) for all locations (top row) versus crashes within 100m of the PBN (bottom row). The most notable feature here is the much higher proportion of crashes at roundabouts and the lower proportion of crashes at traffic lights. As the PBN generally runs on lower traffic roads, one would expect that there are a greater proportion of intersections with roundabouts and fewer with traffic lights. Whether the change in the distributions of crashes at these intersections matches the change in the proportions of these intersection types is unclear as I don't have the data at this stage. Overall though, 67% of crashes on the PBN occur at intersections, compared to 59.5% of crashes overall. All speed limits, traffic light locations, sign locations used for inferring roundabouts, stop signs etc. are current locations as of March 2019, and these road conditions may have changed since the crash was recorded. Materials published on this website can be reused freely. If you do so, I'd be interested in hearing from you - my email address is below. Although the data is accurate to the best of my knowledge, I take no responsibility for any errors though I'd be rather embarrassed! Please contact me for the Matlab source code for extracting and processing the various data, if you want to verify the code yourself or play with the data further to make your own interpretations. If you want to verify the accuracy of the website, each crash ID is shown when you click on it, which you can then cross-reference against the raw Main Roads crash data you can download from the above link. It will also be fairly easy to adapt for other types of crashes, e.g. if someone wanted to do a similar thing for motorcycles. The crash map uses Leaflet and MarkerClusterer to show the number of crashes at the same location. It's not what it sounds like! Rather, it's an annual weekend-long event promoting the use of open government data. The website says it best: "GovHack is an event that draws people together to innovate with Open Government Data. The best teams have a mix of skill so we encourage every one to come along including entrepreneurs, developers, designers, digital media creators, artists, story tellers, researchers and open data enthusiasts." It's sponsored by many government departments and other organisations with interests such as the RAC - Rubber Side Up won the RAC Safe Mobility Prize in 2015. This is just one GovHack project - definitely check out the other entries, and support it in any way you can to produce more projects like this. This website was created by me, Daniel Wedge. I'm a programmer and researcher working in computer vision, machine learning and visualisation who likes to get around by bike. You may have seen in the news that I work at UWA but I'd like to emphasise that this is independent work I started at GovHack and now continue in my spare time - the analysis, comments and opinions are my own, not my employer's.